Not-quite six days in Saigon reaffirms my belief in the goodness of street food. On this trip, for a project we'll be working on over the next couple of months, we ate many meals off the street. Most were decent, and some were close to very good. But few matched in downright deliciousness what we ate in and around the wet markets we visited every morning. In Saigon most every market save the smallest has a central 'food court' comprised of squares of tiled counters surrounding cooking areas. These stalls are where market workers and shoppers eat their breakfasts and lunches (food vendors also deliver in and around the market) and it's where we started our mornings, with a glass or two of cafe sua da (iced coffee) and fresh-squeezed orange juice, followed by something solid sourced at whichever stall was doing the best business. Sated - for the moment, anyway - we'd then cruise the market's indoor aisles, eventually moving outside (most markets overflow their official market buildings, vendors and their wares seeping into the streets and alleys around), in search of chatty sellers and residents and shopkeepers, interesting produce, and, eventually, second and third breakfasts. 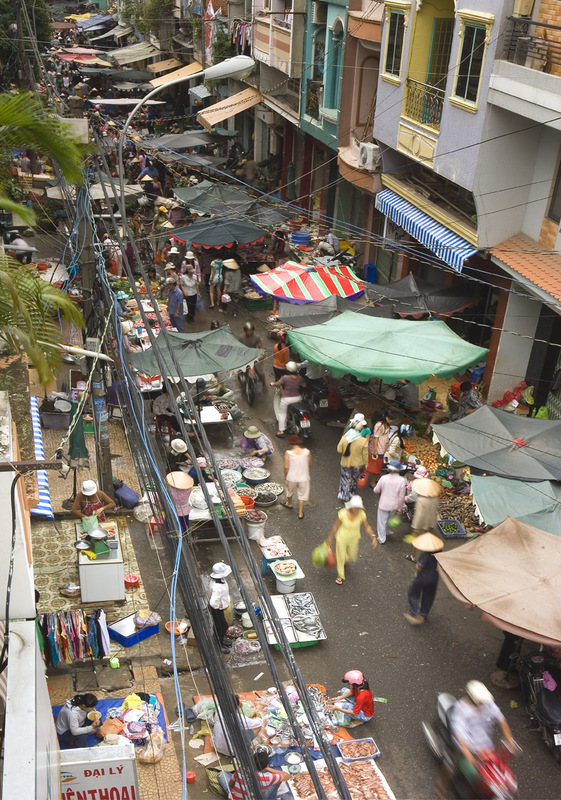 Pham Van Hai Market sits in a Saigon district heavily populated by northern Vietnamese and, we surmised by the number of Korean shops and restaurants advertising Northern Korean dishes, North Koreans. 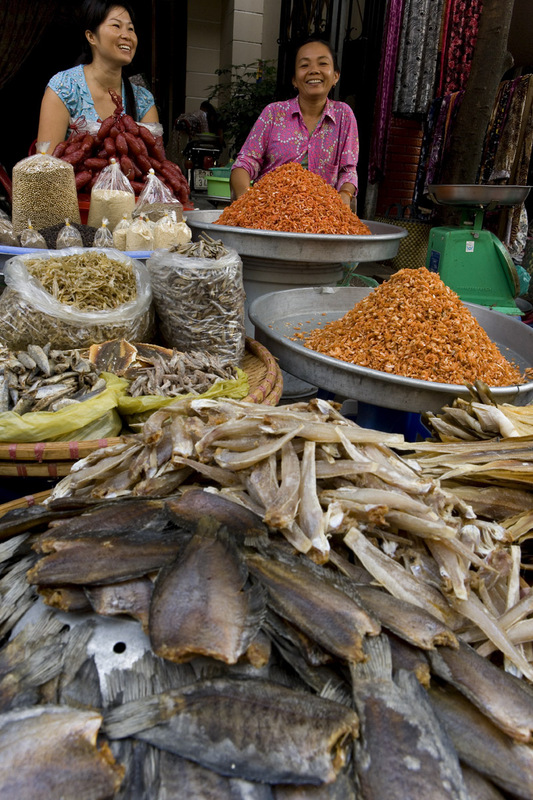 Here you'll find - among the items ubiquitous to any Vietnamese market, such as more grades of dried shrimp than I ever thought possible - northern Vietnamese foods like small round white eggplants, pickled. You'll also find lots of small paddy crabs waiting to be ground up for northern dishes such as bun rieu cua, rice noodles in tomato and crab broth. Near the end of the street pictured above we spied a butcher eating a dish that included flat wide noodles, a type we've not seen used much in Vietnam. At first she thought we were shopping for pork, but finally understood that we were more interested in her noodles than in her chops. What is it? we asked. 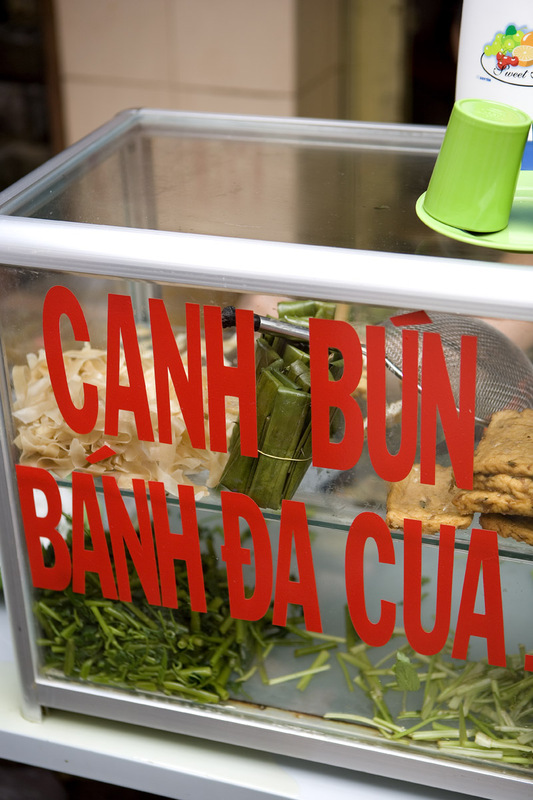 'Bánh đa,' she answered, gesturing with her chopsticks down the street. 'It's good! 7,000 dong!' she told us. We eventually found our way to a vendor seated on a tiny plastic baby stool (is there any other kind, in Vietnam?) in front of a glass display case packed with wide noodles, deep-fried tofu, leaf-wrapped sausage, blanched water spinach, and spring onions. To her left sat a cauldron filled with burbling broth the carroty color of a South Seas sunset, an island of fluffy paddy crab fat 'floater' bobbing gently on its surface. If the soup was a beauty to behold, it proved even better to taste: intensely crabby, a wee bit spicy (but not too much - its hue is courtesy of annato seeds, not chilies), its richness a perfect foil to the still-crunchy, very vegetal water spinach. 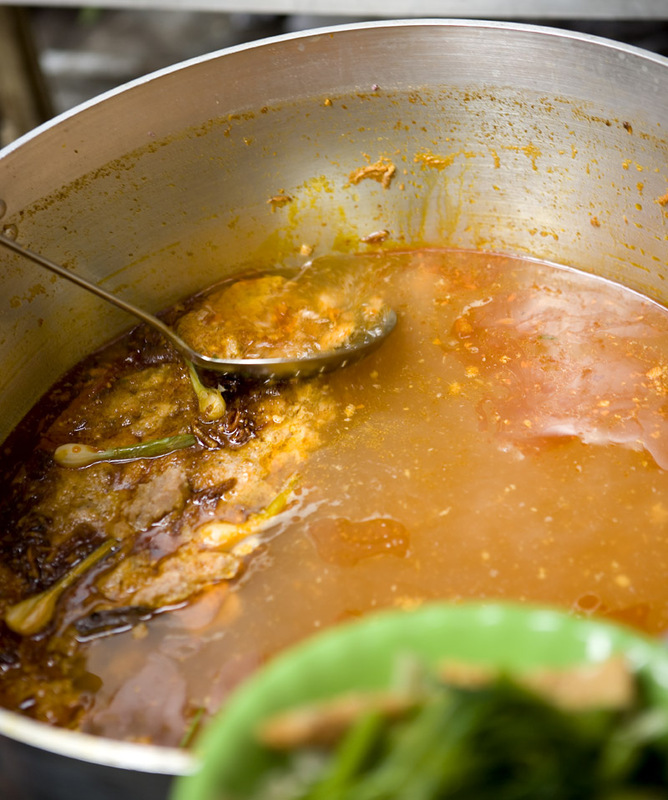 Before adding black pepper-studded pork sausage and deep-fried tofu (flecked with green onion and boasting a wonderful moist-crumbly texture) to the bowl the vendor heated both in the broth. 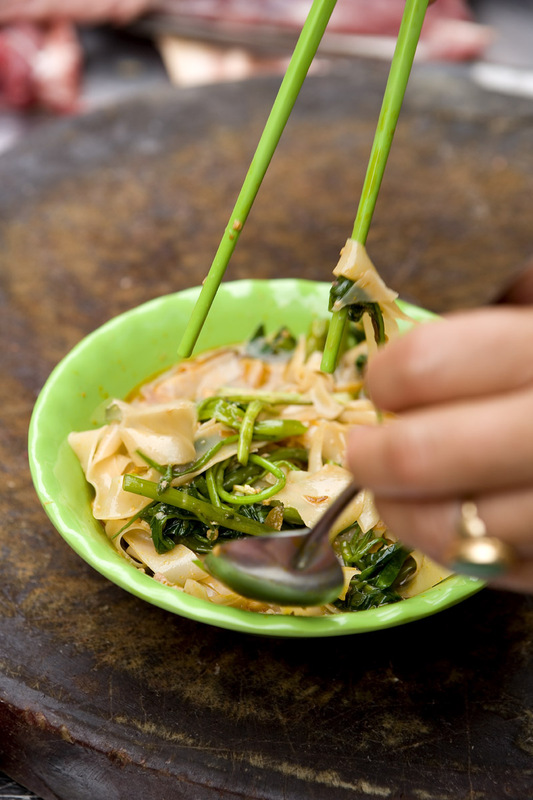 We loved the half-fresh al dente noodles, neither too thick nor too thin, with their pleasing chewiness that didn't dissipate in the heat of the broth. Bánh đa - not the first, or last, market food find of the trip. Nguyễn Truong, 130/71 Dinh Dien, Tan Binh District, tel. 991-2456. Nice . . . .havent been back for ages and think I will plan for year end or maybe early spring . . . . I missed Saigon so much. Wish to see more from you. Nice photos! Never heard of this dish but it sure sound like bun rieu I guess the only thing different is the noodles. 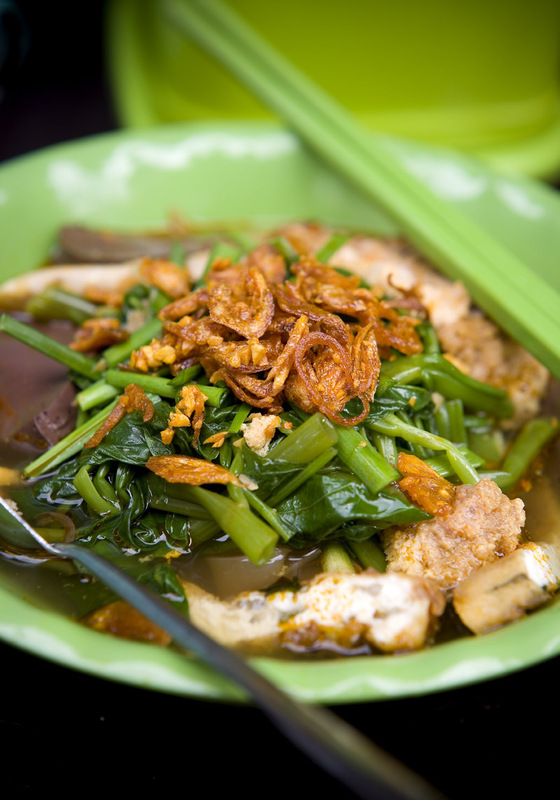 I found you site while doing a search for char kway teow :) and am really loving your wonderful photos. Reminds me how much I'm missing the food in Asia. foodcrazee - you'll never go hungry on a trip to Vietnam, that's for sure. Alex - stay tuned. We'll be hopping back and forth between Cambodia and Saigon for a while. 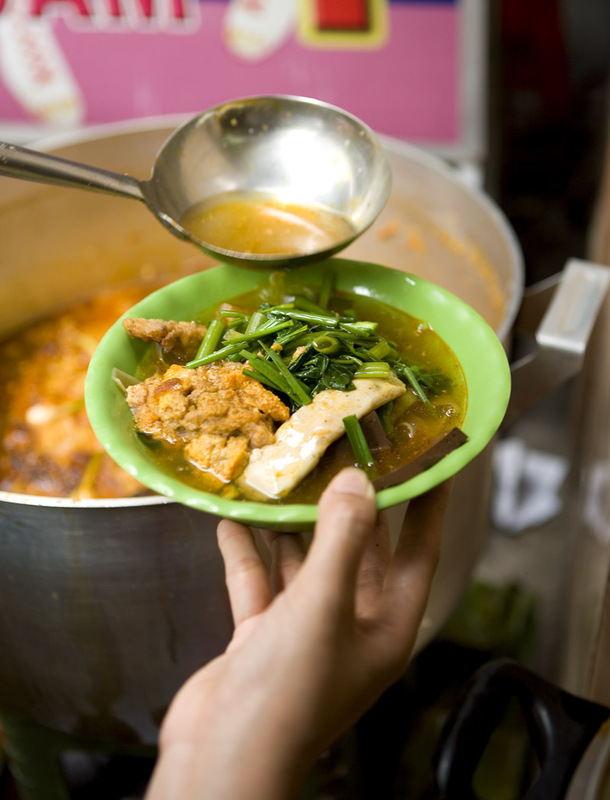 nhbilly - similar to bun rieu, yes. No tomatoes. And the cooked greens already in it (bun rieu has the fresh on the side). Justine - Thanks and welcome!